Creep (beautiful violet)looks great in the inner part of the lid blended with wonder (deeper more blue toned violet) on the outer lid, and a bit of Furore pigment (peach champagne shimmer) in the middle just add a taupe in the crease and it gives a really fresh, eye catching look. 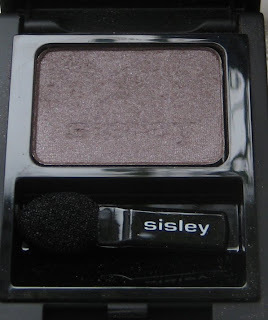 Well I somehow ended up at the Sisley counter again, this time I bought the other eye shadows that caught my eye last time, shade Quartz, I'd describe this as medium grey verging on taupe, really pretty colour, great for those cool toned. I also bought two lipsticks which I am not that pleased with Phyto-Lip Shine in sheer Burgundy and one of the Rouge à Lèvres Hydratant Longue Tenue lipsticks. I'll post pictures of the lipsticks soon but will say that the Phyto-Lip Shine fades incredibly quickly ( I have several sheer lipsticks my favourite being Armani sheers and they last much longer). What put me off was the SA, once she realised I was only buying makeup ( I imagine Sisley make most of their money on skincare as they makeup isn't too ridiculous priced) became less helpful, less interested and started talking to another SA over me, rude, so won't be going back there ! 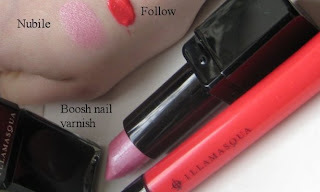 I currently have four Illamasqua lipsticks. 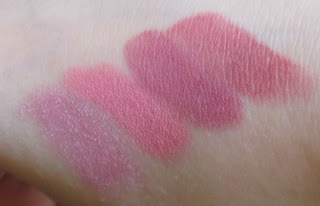 They are the most pigmented lipsticks I have ever tried and last well. 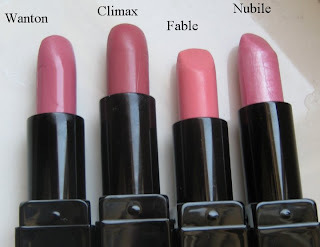 Nubile is the only one with shimmer and its almost a frosty sheer silvered pink on me. The other colours I have are very opaque. These retail for £16.50 in the UK. I really like the formula of these, moisturising almost balm like. If you don't like the usual sticky glosses (Stila, Chanel, Mac etc) you will love these and I think they will be great for winter months. Surprising long lasting as well with the added bonus of the lemon sugar scent. Currently you can only get Fresh in the UK via their London Marylebone High Street, you can mail order their stuff, postage is quite high but they are really friendly and will usually put some samples in which is always a good thing ! 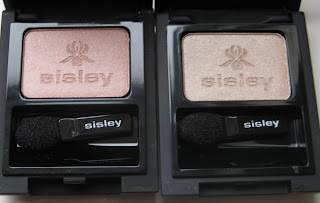 This is the first time I have bought Sisley cosmetics. 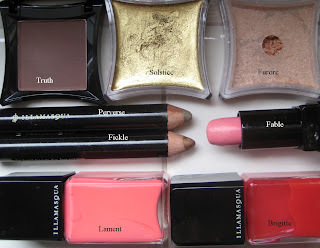 Their eye shadows cost £23 so price wise they are a long the lines of Chantecaille. 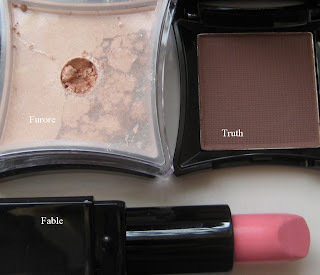 Having looked at their make up range the first thing that struck me is that's its quite small and offers very basic shades, this is not a line for people who like to experiment with colors. I picked out two shades of shadow, Sorbet a sheer shimmery peach champagne and Dune a sheer shimmery beige with a slight gold tone to it. These shadows are easy to apply and real no brainer shades, great when you don't want to have to spend to much time on your makeup. They are very smooth, last and the colour stays true. 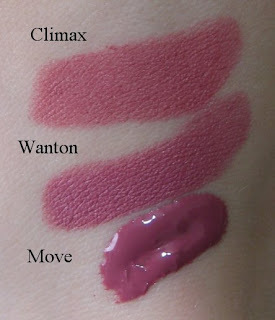 Would I buy anymore, well to be honest there is probably only one other shade I'd get ( a taupe, who can resist taupe's !) 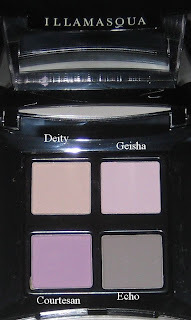 but this is more to do with the lack of interesting shades rather than the performance of the product. 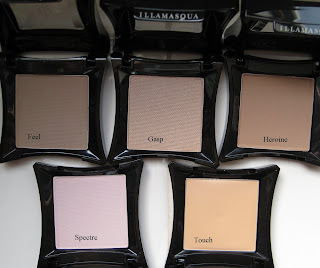 I'm really loving Illamasqua and for those like me who order from the site without seeing the products first, I thought it would be helpful to post pictures of my hauls.